The relationship between an investor and an advisor can be simple or complex, and portfolios will often mirror the level of influence an advisor has over an investor’s decision-making process. The different levels of advisor involvement and advisor dependency can have an extraordinary effect upon the products and services which appear in an investor’s portfolio. Namely, investors with a high degree of advisor dependency often have very different portfolios than those investors with a low level of advisor involvement. Spectrem’s annual analysis of the portfolios of affluent investors segments investors by their level of advisor dependency. The research shows that investors who do their own investing have markedly different asset allocations than do investors who allow their advisor to make the investment decisions for their portfolio. 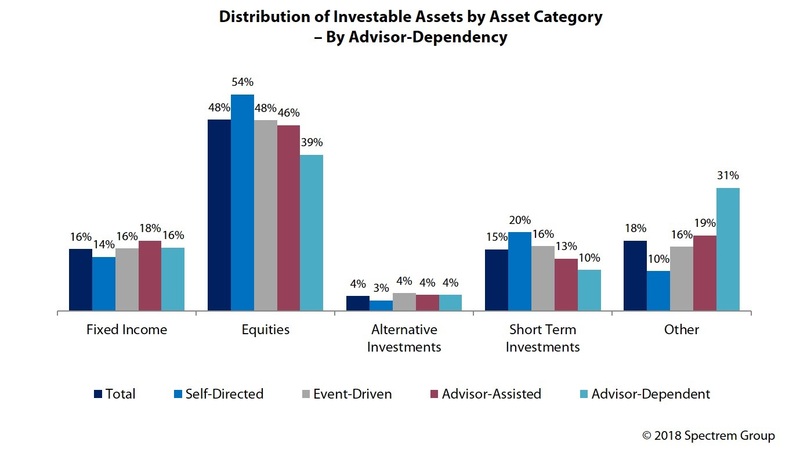 The report makes clear the specific differences between portfolios based on advisor dependency. Among Millionaires, those investors with a net worth between $1 million and $5 million, Advisor-Dependent investors report 68 percent of their total assets as investable assets, while Self-Directed and Event-Driven investors average only 56 percent of investable assets out of their total asset list. Advisor-Dependent investors are as the title indicates, likely to allow their advisor to make most if not all decisions related to investments. Self-Directed investors make almost all of their own decisions, and Event-Driven investors are those who contact an advisor only for special financial situations such as retirement planning or estate transfer. Looking at the asset categories invested in, Advisor-Dependent investors tend to be more diversified, with 39 percent of investable assets in equities and 31 percent in fixed income products, on average. By comparison, Self-Directed investors on average have 54 percent of their investable assets assigned to equities and only 10 percent in fixed income. There is also a marked difference in the short-term investments, with 20 percent of the Self-Directed investor’s investable assets going that way while only 10 percent of an Advisor-Dependent assets put into short-term investments. Do the more independent investors, who save money in advisor fees and commissions by doing it themselves, lose money in the end because advisors are better at investing than investors are? The research states the facts: Advisor-Dependent investors have a greater percentage of their total assets as investable assets, and have a more balanced investment strategy between equities and fixed income products than do investors who are less advisor-reliant. The research does not answer the question as to which is the more financially successful approach to investing. When dealing with an investor who has their own plans for investing, advisors often serve to nudge that client in one direction or another to best satisfy their desires. With advisor-dependent investors, advisors often make decisions without a great deal of direction other than to build the portfolio. But advisors should give thought to engaging those dependent investors into the process more, in order to increase client satisfaction. They may not be particularly knowledgeable, but every bit of information an advisor provides makes for a more knowledgeable client, and that probably helps to increase satisfaction.